It’s been a couple of days since the “Super Smash Bros. Wii U 50-Fact Extravaganza” and there are still things we haven’t told you about. The newest entry in the series has tons of new modes, but there’s one that stands out as the best way to rake in all of the goodies…if you’re good enough. Special Orders Mode brings back a concept similar to Melee‘s Challenge Mode, but really kicks it up a notch. Putting forth the effort in Special Orders makes getting those stat boosting items and trophies much less time consuming. 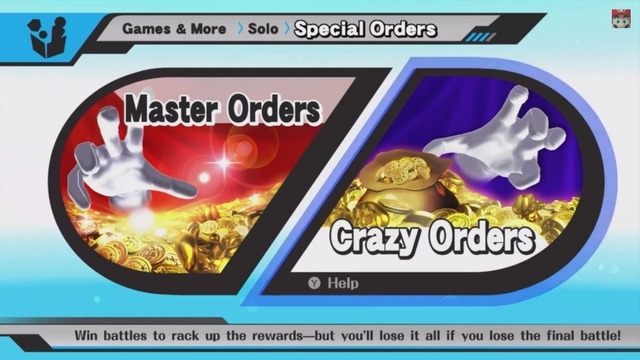 This mode is broken down into two sub-modes: Master Orders and Crazy Orders. In Master Orders, players are given a selection of randomly generated tickets to choose from. The ticket displays the battle conditions and the difficulty setting. Also shown on the ticket is a gift box with a logo, theoretically corresponding to the character that the prize can be used with. This gives players the chance to have a hand in deciding what item they may receive for accomplishing a goal. Of course, higher difficulty match-ups will score better prizes. These tickets can only be used once, so make sure you are ready if you really want that prize. Crazy Orders is a little bit more…well, crazy. In order to play, you must either spend gold or use a pass, which can be collected through gameplay. Once your set to play, you are given a time limit to complete as many challenges as you can. The difficulty of these challenges increase with every match and, in All-Star Mode fashion, you don’t get the chance to start every match as a fresh fighter. Once you think you have just about had enough, you are given the chance to face off against Crazy Hand in the final round. If you win, you get to keep the massive amount of prizes that you have collected. But if you lose, you get absolutely nothing. What do you think about this new mode? Are you excited to test your skills in one of the most challenging ways the game has to offer? Let us know in the comments below.